Nerve cells are a functional and structural unit of the nervous system. It is specialized to transmit stimuli throughout the body. A nerve cell is called the neuron. It consists of body cells or the soma, several processes or the dendrites and one long process or the axon. These processes are called “neurites” and they receive and send the information to the brain and spinal cord. Although the axon is a single process of a nerve cell, it can have numerous bifurcations which can send back a branch to its own cell body. This kind of processes is called “axon collateral”. 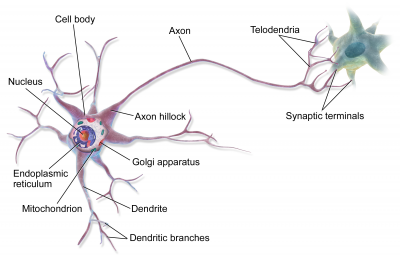 What is The Axon Collateral? The axon is located on the body of the neuron. Closing branches which can further elongate out of the axon are telodendrons. The neurons have only one axon, whose length can be up to 1m, but the axon can have bifurcations in a shape of axon projections. Each of the collateral may end by bifurcation called the telodendron. Axon can be externally enveloped by the myelin sheath. This sheath along the axon never extends continuously but at certain places, leaving uncovered places. These are the places where laterally at the right angle an axon collateral can appear. The places without the myelin are called “Nodes of Ranvier.” These nodes are promoting high speed of information transmission throughout the nervous system. The axon collateral is wrapped in the myelin sheath, too. It can make contact with the dendrite or cell body of another or the same neurons. We can say that the axon collateral is a branch of the main axon and usually feeds back onto the soma. Its function is to provide modulation and regulation of the cell firing pattern. Along the axon, the transmission of the depolarization wave happens. Some cells in excitation can give a toxic response with too many cellular activities due to the stimulated cell. How does it happen? Nerve cells have two basic types of extensions. They are the dendrites and the axon. The dendrites accept the signal received from the other nerve cells and the axon carried signals to the axon terminals. The axon terminals send signals to the next nerve cell and so forth. The axon collateral can be a part of feedback mechanism which creates a connection with nearby inhibitory neurons and thus, they can be involved in regulation of the neuron over excitation. In such cases, when the pyramidal or the excitatory cells get depolarized, their axon collaterals can regulate its function by creating connections with inhibitory interneurons. Although it is a part of regulation process, some scientists believe it is another way of cell preservation since it saves the cells from toxicity of a response of the cell which are overly stimulated and by doing that, it would lead to “excito-toxicity” which is a self-destruction process.